Trotec Laser Online Magazine: Happy Valentines Day! Valentine's Day is only a few days away... What would be better than a personalized gift for your loved ones? Which is why Trotec has great this great Valentine's Day application... Excellent for a candle light dinner for two! The wooden candle holder can be personalized with names, dates, or a special message. In this example, we used alder but of course, you can use any type of wood to create this fun application! 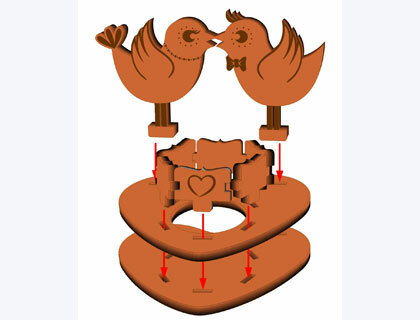 Download the file and complete assembly instructions for the Love Bird Tea Light Holder! For other great holiday applications, free laser projects, and more ideas visit our Laser Sample page on our website! Happy Valentine's Day from everyone at Trotec! What are you doing for Valentines Day? Planning on making a personalized gift with your laser for your loved one? We would love to see your work... Share photos of your version of this great Valentine's Day candle or your very own Valentine's Day creations!